Whether they are celebrating Christmas in Finland or Abroad, most Finns consider December 24th to be the year’s most significant holiday. While the season culminates in Christmas Day in many cultures, Finns place the most emphasis on Christmas Eve. Santa Claus visits children in person instead of sneaking in through the chimney, and many families plan the evening’s dinner menu for weeks in advance. Below are some reflections on Christmas by Jaana Rehnstrom, Finland Center’s president and a longtime expatriot. You can also find this article in the newest issue of Raivaaja. I love Christmas, always have. In my childhood in Finland, we would put the (vinyl) records with Christmas songs on and live with the music creating the mood during the whole of the Advent season. In fact, my three siblings and I used to love the music so much that my parents had to institute a rule that we could not play the records before November 1st. The season culminated in Christmas Eve, when we would drive out to our country place and cut down a Christmas tree, and go home and decorate it; to be followed by a traditional meal and Santa visiting in person. There were presents and we could stay up as late as we wanted that night. For my own family here in New York, I have wanted to pass on some of those traditions. Christmas is different in Finland and in New York in a couple of ways: It seems to me that in New York, Christmas is just another one-day holiday – despite the ubiquitous seasonal decorations and marketing here in the US, in Finland we anticipate Christmas more. One example is the many pikkujoulu (pre-Christmas) parties the Finns put up even here away from home. Also, since we are lucky to have a Finnish Lutheran Congregation here, my family participates in the event that marks the beginning of the Advent season, Kauneimmat Joululaulut (the Christmas carol singalong event). When the children were small, they always got their Advent calendars from Mummu in Finland. As Christmas gets closer, we write our annual Christmas letter to friends and relatives, and debate whether to send it by email or on paper. We receive Christmas cards from friends around the world, including a lot of those plain postcard type Christmas cards from Finland, and hang them up by the fireplace. When my children were small, they loved baking gingerbread cookies and joulutorttuja (prune tarts) with me; nowadays I’m lucky if I can get them to lend a hand. Mind you, they still love eating them! The Christmas tree gets bought and decorated a few days before Christmas – there is simply too much to do to leave it to the last minute. We also put up decorations in the house – angels and elves made of various materials; some store-bought and some home-made by the kids when they were small. They still get wrapped up and put away and taken out again each year. On Christmas Eve, we have rice porridge for lunch, with the obligatory almond of course. We usually try to go to our other local (Episcopal) church to take part in at least one service during the season. For a number of years, my children sang in the children’s choir there, so the family schedule was much dictated by theirs. Still, we always managed to have a celebration beginning with late-afternoon glögi while we sing Christmas songs, both in English and in Finnish (that is the only time in the year I get back to the piano to accompany us). This is followed by a reading of the Christmas story at the table, after which everyone digs in: the first course consists of herring, gravlax, rosolli and boiled potatoes; this is followed by turkey and ham, lanttulaatikko (rutabaga casserole) and carrot casserole, along with some green vegetables. We open presents in the evening accompanied by coffee and gingerbread plus joulutorttuja and Finnish chocolates which we buy at the Christmas bazaar here. We often have guests – sometimes from abroad, or sometimes expat Finns. When the children were small and still believed in Santa Claus, one of the guests would all of a sudden “have to go check on his car, parked on the street” – missing Santa, who would arrive just at that time, from Lapland of course, with the presents. Since our townhouse has a fire escape outside leading to the third-floor living room, he would ascend the fire escape and climb in the window, with any little ones present hopping and shrieking with joy! We have miles of videotape of Christmas eves to watch, in my retirement I suppose. Nowadays the evening ends quietly with everyone delving into their new books with Finnish and English Christmas music playing in the background; or we may decide we need fresh air, and take a walk to the late Christmas service at Grace Church. Personally, I prefer that schedule to getting up early on Christmas morning – especially these days with no horses, sleighs or even snow! Some of you might know me as a reporter who writes for Raivaaja and New World Finn but apparently, as this photo shows, I must have some kind of secret life as that Scandinavian light-bringer herself, Santa Lucia. This all happened innocently enough. I help out with PR for Kris Waldherr Art and Words gallery, and back in November, Kris and I were planning events to hold in the studio during the holiday season. When she mentioned an indoor artisan fair that would take place mid-December, I noted that one of the planned dates would be December 13. Editor’s note: In many European nations, December 13th marks the annual Saint Lucia Day, a holiday devoted to Italian Saint Lucy (or Santa Lucia), the bearer of light. Finns commemorate the occasion by electing a local young woman to serve as an ‘official’ Lucia and lead an annual parade in the Helsinki city center. In the Scandinavian tradition, Lucia wears a white dress, a red sash around her waist and a crown of candles. We thought this was a great idea – better yet, I thought, since my crown is one of those battery-operated ones and not the kind that holds burning candles. Accidentally setting something on fire would be a hazard of the job I could live without. And never mind I couldn’t sing to save my life – this Lucia would simply pop in a CD and… well what? I hadn’t thought it out that far. Walk around the gallery, I guess! I did end up finding a copy at home of “40 Rakkainta Joululaulua” [40 Most Beloved Christmas Songs], which included the Lucia song in Finnish, and sung by a children’s choir. Since this was shaping up to be a children’s event, this arrangement would be perfect. As for the white gown, a quick search through the L.L. Bean catalog produced a white nightgown that would do double duty as a saintly shift. The day of the event, I made glogg (a Scandinavian Christmas drink) for the crowd. Not one to toil, I had found it at IKEA for $2.99 a bottle. My husband, Peter, helped me transport my wardrobe and accessories to the gallery, and referred to himself as Santa Lucia’s roadie. Is there a Finnish sauna in New York City? The answer is: Well, sort of. Yesterday I went to the Russian & Turkish Baths in lower Manhattan, to see what they were like. Mind you, I had heard of this establishment in the past from a few Finns but had not followed through, as I didn’t see the words “Finnish Sauna” in the title. Upon entering the place, I noticed President Ahtisaari’s picture, along with other noted celebrities – now they can claim to have had a Nobel Peace Prize Winner as a customer! Not claiming to be a sauna ‘master’ but having been to dozens of saunas here in the US and Finland, I did not know what to expect from the Russian or Turkish versions. Some things were immediately different. Swimsuits are mandatory, for example, and the whole operation is coed. I went downstairs, which was quite full of people. After doing a quick scan I noticed a good-sized cold water pool, and several different “steam” rooms: Russian, Turkish, aromatherapy, and at the end of the hall, what appeared to be a traditional Finnish sauna. 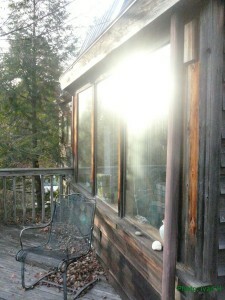 The tile was “Redwood Steambath,’ however – NOT Finnish Sauna. There was something different in each one (The Russian one was very large and of stone/concrete, the Turkish had tiled walls and heating pipes under the wooden benches, the aroma therapy room was rather “foggy", and the Finnish Sauna had a nice smell of wood, and a stone oven). 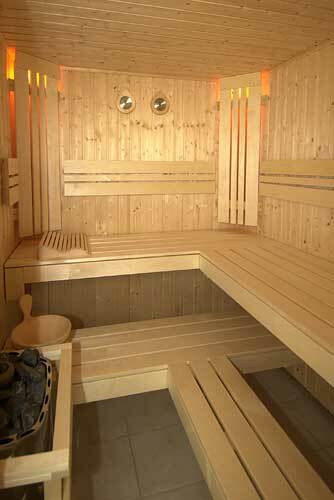 What was surprising was the sauna had very few people in it at almost all times! I tried all of the baths and I guess I favoured the sauna (surprised?) but overall it was a good experience. Check the place out here. So, will there ever be in New York City, an operation dedicated solely to the Finnish Sauna? Well, here is a response from an American who has joined the Finland Center and also volunteers to help promote advertisement in their newsletter/web page – which is a lot of fun. My association with Finland/Finns/Finnish Americans goes back to my childhood, as some of my neighbours in Gloucester, MA were of Finnish descent. I was exposed to some of the traditional foodstuffs and of course sauna. I used to look at a magazine ‘Suomen Silta’ and would marvel at the pictures of the country – what a great looking place (I do have a fondness for forests). My late neighbor, Armas, worked in the granite quarries of Gloucester and Rockport, along with other Finns, who were a significant ethnic group in that trade. Years ago I was the ‘house man’ for a former Finnish ambassador to the UN (a job gotten through my Finnish girlfriend at the time) and later worked for the Finnish-American Chamber of Commerce in NY. My first time in Finland was a real ‘culture shock’ as so many aspects of the country and the environment really are close to my heart. Through the years I have always put forward a good word about Finland and have gotten others to visit the country. Although, I realize that Finland is not a country for everyone as it’s not a place of excitement and the people are reserved but that is refreshing when you compare it to the hustle and bustle of a city like New York. It was rather interesting to see so many people not talking in public. Once in a restaurant, I noticed a couple come in and say practically nothing to each other except when ordering. But I must say, Finns don’t talk nonsense and they are straightforward, which I like. To me Finland is like a very special place tucked away in the north. A few months ago I noticed a copy of the Finland Center newsletter and decided to become active with the Finnish community, so I joined and volunteered to help out. Having the previously mentioned experience with the Finnish American Chamber of Commerce, it was decided I help with corporate involvement, which is what I do. So, if there are any other Americans out there reading this blog and have any interest in Finland and the 3 C’s of The Finland Center (commerce, culture and community), don’t waste any time and join! December’s status as a season of celebration is arguably even more pronounced in Finland than here in the U.S. Many families light candles on Sunday mornings to commemorate the four Advents, and on December 13th the center of Helsinki is taken over by the annual St. Lucia’s Day parade. December 6th, meanwhile, is Finland’s official birthday, and provides a patriotic note to the already festive season. Exactly 91 years ago, Finland’s Parliament declared the former Grand Duchy of Russia an independent nation. Perhaps the most notable Independence Day celebration is the Finnish President’s annual reception. Up to 2,000 politicians, military personnel, scientists, athletes, and other notable individuals are invited each year to the formal event. It’s consistently the year’s most viewed event on television. The Finland Center Foundation would like to wish all of our members and friends a festive and relaxing Independence Day! About ten years ago, on a November afternoon, I was standing on Lexington Avenue in Manhattan, not knowing why there were no people around. It was Thursday afternoon and – now seemingly obvious – a Thanksgiving Day. Having just come from Finland, I had no idea about the concept of Thanksgiving. Not knowing really what to do, I met with another lost Finnish soul, we bought a bottle of whiskey, and went to his place on 30’s and 7th. While watching the crowds returning from the Parade, we finished the bottle and went down to have a turkey sandwich in a diner. It was not a bad Thanksgiving but hardly a one you would get in your top-ten list of the best parties. So much has changed during these years. Now Thanksgiving, in a sense, has partly replaced Christmas for me. And I have always been a big Christmas person. It was actually so big for me when I was a child back in Finland that it was painful. And it was very painful for people around me in New York. People who couldn’t get me, with all the stories about the snow, the cleaning of the house, the cooking that started in October, the candles hand-made in a garage, the hunt for the perfect Christmas tree with my father in a complete darkness 7 o’clock in the morning, and the stars, the birds singing in the yard, and sleigh-rides to Christmas church. By now I have completely embraced the whole concept of TG – as we tenderly want to call Thanksgiving. It has the very best elements of any important holiday with a touch of healthy sarcasm, like the obligatory football match and a case of Budweiser. This year, as several years in a row, I will be going upstate to my friends’ house. There will be a lot of cooking together with family and friends, walking outside breathing the fresh mountain air, and plenty of wine. Turkey will be served, I will make my ‘creamy mushroom sauce’, probably a portion of ‘glögi’ (or ‘mulled wine’), but most of all, it will be a day of being together, thinking nice, talking smooth, and having the feeling of ‘togetherness’. You will hear children laughing, music playing, and at some point the host will stand up, raise his glass, and make a toast for the occasion. And if you step outside, there won’t be anything else around than the eternal sky and the nature whispering in the frost: ‘Peace on earth’. Isn’t it beginning to look a lot like Christmas! I probably started compensating parts of Christmas with Thanksgiving because it manages to avoid the excess hassle that occurs around Christmas in Finland. When you live in complete darkness for a hefty part of your life, you might have a tendency to overdo the ‘Holiday of Light’. And when it actually doesn’t take away the darkness, you can feel a bit ripped-off. Americans have the luxury to separate the ‘family get-together’ from the ‘present-giving frenzy’. But Finns never thought of it. But I’m taking full advantage and though my eyes will still get wet while caroling on Christmas Eve, on November 27th I will dedicate a specially warm toast to Americans who taught me to have another nice holiday, another party, and another reason to say ‘Terveydeksi – For Your Health’. Jazz vocalist Ira Kaspi and guitarist Peter Engberg have performed as a duo for the past eight years. Both academically trained (Kaspi graduated from Berklee College, Engberg from the Sibelius Academy and the Musicians’ Institute), the two add a jazzy spin onto a wide range of melodies, from jazz standards and original compositions to current pop and rock hits. Kaspi and Engberg host a monthly jazz club at Helsinki’s famous hotel Torni, play at jazz festivals and corporate events around Finland, and recently took their act to Prague. Earlier this week, I caught up with Kaspi and Engberg over breakfast to find out more about their musical background and their reasons for paying a visit to America’s unofficial music capital. What brings you to Salmagundi? Ira: Jaana [Rehnstrom] heard us play at a jazz festival in Finland this summer. She was walking by and stopped to listen. I guess she enjoyed it, because she came over and invited us. We are really excited, because New York is such a wonderful place for musicians to visit. Do you have any regular projects going on in Finland? Peter: We perform once a month at Hotel Torni’s American Bar [in Helsinki]. Our gimmick is the idea that we invite pop and rock stars to sing jazz music. It’s something that people aren’t used to hearing. We do our own arrangements of their hit songs. Maija Vilkkumaa, Sakari Kuosmanen, Timo Rautio and Mariko have all performed with us. Do you have any trouble convincing these singers to try out some jazz? Peter: They are always really excited to join us. Ira: Some even call and ask if they can participate, that they want to sing jazz too. A lot of these musicians really dig jazz as a genre. No-one’s said no yet. Ira, are you purely a jazz singer or do you branch out to other genres too? Ira: Well, I’ve mostly been labeled a jazz musician. On occasion I’ve thought that maybe it’s not such a good thing, but in the end my career has gone exactly how it was supposed to. Jazz is my arena, where I feel at home. I also sing quite a bit with big bands, and freelance a with other bands, so often I end up singing all kinds of genres. Peter: Don’t forget to mention that you have your own school too. Ira: Oh, yes, my music school, [called Rytmi Omena] in Lohja. I’m the CEO. It’s a school for pop and jazz music. There was really a need for something like that in the area, because although they had a very good classical music academy, young people still wanted to play rock. It’s an institute mainly geared for children and teenagers–the average age is between 12 and 15–we have adult students too. Ira: The challenges are entirely different in teaching kids and professional musicians. Professionally geared students have a very firmly set ambitions and goals, whereas with kids there is a kind of “off the streets”-mentality to it. Music gives them something valuable to do. But it’s also the age where we can discover those, who have professional potential. Have you been to New York before? Peter: I’ve only been to the airport, during a layover. Ira: I got my music degree at Berklee School of Music in Boston in 1990, so I’ve been before. How did you end up at Berklee? Ira: As a child, I went to American schools in Brussels and Stockholm, and always had that dream in the back of my mind to return to the US for college. My dad’s cousin, who lived in Boston, sent me the application papers. Boston is a lovely city, so it was a fantastic four years. Do you have any particular things you have to see or do while in New York? Peter: We actually plan on recording a song here. One of our friends recommended Uptime Studios. Ira: We wrote a song specifically for this trip, that describes the feeling of breathing in and seeing and sensing the streets of New York. Even the lights are different here; they are all trapped inside halogen lamps, whereas in Finland the light seems to come from the stars. We wrote the song in a new way too, where we came up with the lyrics and the melody at the same time, in the same space. We really enjoyed it. So how do you usually write your material? Ira: Peter usually writes a melody based on my lyrics. What should the audience expect on Friday night? Do you plan to only perform original songs? Peter: We’re also going to do some standards. Ira: And also some of the hit songs we’ve covered as jazz versions with our visiting stars at Torni. You plan to come out with a new album next year. What should we look forward to? Peter: We’ve always done a lot of standards, so this one will probably include mostly original songs. Helsinki-born Rea Nurmi moved to the US in the mid-70's, and transitioned from a job as a designer at an engineering firm to visual art a decade later. Drawing much of her inspiration from living, evolving nature, Nurmi has gained international recognition through her Healing Walls murals in hospitals and nursing homes around the world. Her latest exhibit of pastel and acrylic paintings, Sea Change, explores the vibrancy of water. Last week I sat down with Nurmi to find out about her career, her work ethic, and what she considers to be the most rewarding aspect of her job. What made you decide to transition from a career in engineering to being a full-time artist? Nurmi: For better or for worse, I was looking for a change after too many years of doing straight, black lines. My body told me that I needed a change. This is called burnout nowadays, but I didn’t know then what it was. I was studying at night [to become an electronic engineer] and working full-time, and knew that I needed something else in my life. So I decided to start painting then, in 1986. Before the mid-80's, you had little to no experience in painting or visual art. How did you transition into this new career? Nurmi: Having been in a technical field, I already had a strong eye, and an understanding of proportions. I began by painting portraits, because they involve a lot of measuring. If you don’t achieve the accurate proportions, your subject stops looking like a real person. So in a way, I was using the skills I already had. By adding color onto the picture afterward, I was able to breathe life into it and make it feel less like a technical task. Did you study art formally? Nurmi: I took courses in painting and art history at Southern Connecticut State University, so I could gather all the required information, but I took these courses based on whatever I needed at the time. Later, when I received a grant from the Pastel Society of America, I studied with independent artists in New York. What made you focus on Pastels? Nurmi: I feel that pastel colors allow you to be more closely attached to the work itself. Pastels also have the brightest colors imaginable. In watercolors the paint is partially dissolved by water, and even with oil colors you add something else, but with pastels, there is just the color itself. Real red, for example, can only be achieved with pastels. Where was your first exhibit? Nurmi: Martha’s Vineyard [in 1988]. I was painting sea shells at the time; they were a challenge because seashells are round and then hollow, so they are difficult objects to paint. I’d set up the shells onto the sand and paint them like I would paint a landscape. And because of its island location, Martha’s Vineyard was a good place for the exhibit. How about your current solo show, Sea Change? What was the artistic motif behind this exhibit? Nurmi: I painted water. It’s the idea that everything moves and changes, just like I, as an artist, have changed, whether I was changing my career or changing my artistic subjects. Nothing stays the same–people get older, have children and change careers, and life moves forward. Water is an element that constantly changes. I portray fish swimming below the surface of the water and birds flying above it, but water is always part of the process. What’s your work routine? When and where do you paint? Nurmi: I paint at home, never outside. But when the mood strikes, I produce a lot. And then sometimes there are several months in between where I don’t paint. Running my own company, I need to reserve time for marketing, so I can’t paint all the time. Do you do other work besides paint? Nurmi: Sometimes I do contract work because I speak Finnish–for example, I’m an interpreter for the U.S. State Department, so every once and a while I get a call from there. Sometimes I also do translation work. I love meeting people and talking to them, but as an artist you don’t meet anyone or talk to anyone. You create the work yourself. So having a chance to meet people is wonderful. Where did the idea for Healing Walls come from? Nurmi: I decided that art is more than just for the rich galleries and the well-to-do people. Art is healing as it is. You look at something beautiful and you feel calm and peaceful, and of course some images make you enraged as well. Pictures generate emotion. I thought that art should be taken to places in which it’s most needed, as a calming idea. I wanted to bring nature, the outdoors, into places where it’s most needed, so now I paint healing gardens and seascapes in hospitals and nursing homes. It’s been my most rewarding work because I either paint alone or with the nurses, doctors, patients, or residents at nursing homes. These people aren’t patients like at hospitals, they are residents because it’s their home. It’s been absolutely the most rewarding work for me, and I do a lot of it now. Through Healing Walls, I’m sharing the process of art, which was so meaningful for me when I started that it literally changed my life. What are some of the responses you get for your work, particularly your murals? Nurmi: Most of the time they love that I do it. Many elderly people at these nursing homes want to be part of the painting process, but most people are absolutely afraid of it. And my healing technique in the world is ‘just try it.’ When they say they can’t paint, I take their hand and say ‘oh, it moves up and down, that’s all you need to do in painting.’ I need a lot of blue and green in my work, and anybody can help me with that. And then if they are interested and eager they can do flowers or whatever, and I can add the details. I just help them take a brush in their hand, and some people have actually continued to paint on their own, which is the greatest thanks for me. That I’ve gotten someone started.